KARACHI: Buyers remained on the forefront for the third successive session on Thursday, as the presence of a leading cotton exporter keeping the market highly volatile. Despite brisk activity, the price line remained steady and most of the deals were finalised in the range of Rs8,100 to Rs8,300 per maund. Phutti (seed cotton) prices also stood firm at overnight level. Textile mills and a cotton exporter readily picked up all deals offered by sellers. Consequently, trading volume rose extensively. Phutti prices were remained steady, with Sindh and Punjab qualities quoted in the range of Rs3,500 to Rs3,750 per 40kg. Balochistan variety was traded between Rs37,00 to Rs3,900 per 40kg. However, the cotton yarn market remained depressed owing to slow demand from the value-added textile sector. A leading yarn dealer Noman Anwar told Dawn that Pakistani spinners fail to do aggressive marketing whereas Indian and other nations take full advantage of the situation. “The recent fall in the rupee value against US dollar should have given Pakistani yarn exporters an edge over their competitors but unfortunately this did not happen as they did not enter into deals in a timely and aggressively manner,” he said. “On the contrary countries like Turkey, India and Vietnam do aggressive marketing and take full advantage of the developing situations which help them to capture the world market,” he added. The world leading cotton markets closed easy on slow exports, with New York and China closing easy while Indian cotton remained steady at overnight level. 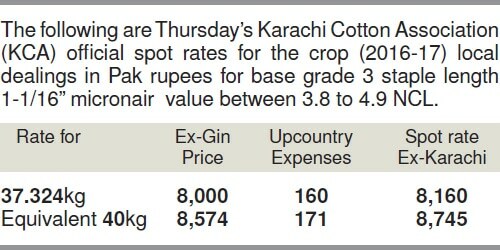 The Karachi Cotton Association (KCA) spot rates were unchanged and stood at previous level. The following major deals were reported to have transpired on ready counter: 3,600 bales, station Shah­dadpur, at Rs8,000-8,100; 2,000 bales, Sanghar, at Rs8,050-8,125; 3,000 bales, Tando Adam, at Rs8,075-8,125; 1,200 bales, Mirpur­khas, at Rs8,050-8,100; 1,000 bales, Kotri, at Rs8,000-8,125; 1,000 bales, Nawa­bshah, at Rs8,050-8,100; 1,000 bales, Hyderabad, at Rs8,050-8,125; 400 bales, Maqsoodo Rind, at Rs8,090-9,100; 200 bales, Fazilpur, at Rs8,300; 200 bales, Khan­ewal, at Rs8,300; 600 bales, Mian Channu, at Rs8,235-8,300; and 600 bales, Chicha­watni, at Rs8,200-8,235.